Two House Democrats filed a bill to make restrictions in union membership cards state law, potentially opening Connecticut to a legal challenge based on the Supreme Court’s Janus v. AFSCME decision. Proposed Bill 6936 was filed by representatives Robyn Porter, D-New Haven, and Michael D’Agostino, D-Hamden, and is referred to the Labor and Public Employees Committee. Those terms refer to language in union membership cards which limit an employee’s ability to cease having dues collected from their paycheck. Although an employee may resign membership from the union, union cards dictate the employee can only apply to cease dues payment during a set window of time. In the case of AFSCME members, those windows are a thirty-day period surrounding the employee’s yearly membership anniversary. 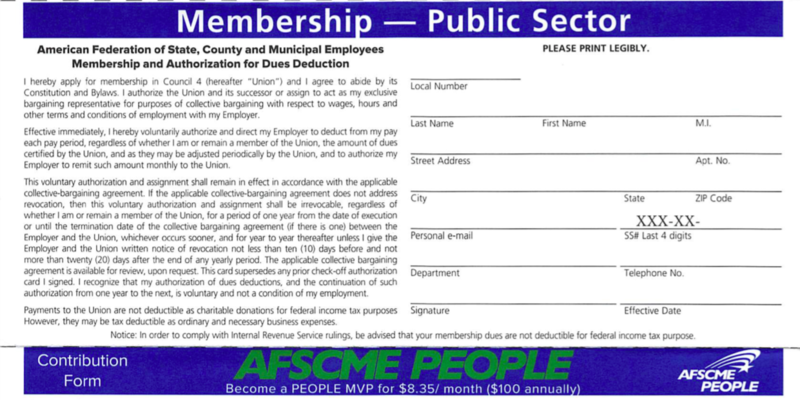 The fine print on AFSCME’s membership card says paying dues “shall be irrevocable, regardless of whether I am or remain a member of the union,” if resignation language is not included in the collective bargaining agreement. Membership windows have come under legal fire in other states, as attorneys representing public employees who have tried to resign membership say these windows are a violation of the Janus decision and, therefore, the employee’s First Amendment rights. But the language of the proposed bill does not address membership in a union, only the authorization to collect dues, essentially giving the appearance of state authority for unions to continue collecting dues from employees who have resigned membership. State or municipal employees who signed membership cards prior to the Janus decision had few options: they could be a dues paying member and be allowed to vote in union leadership elections, or pay an agency fee roughly equal to due and have no vote at all. 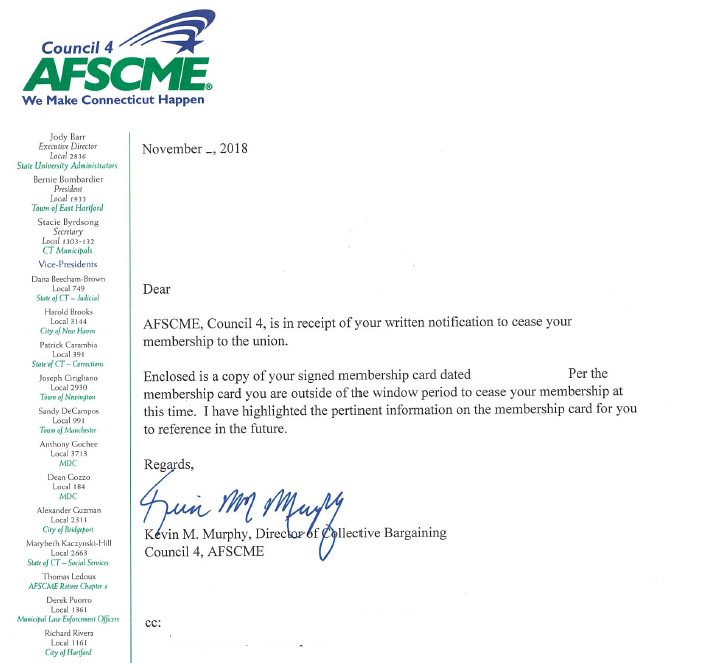 In Connecticut, AFSCME Council 4 has wavered between allowing employees to resign and trying to enforce the windows outlined in membership cards. Following the November 2018 elections, the union – which boasts 30,000 members – began issuing letters denying public-sector workers the right to resign based on their membership cards. The proposed bill would protect the unions from having to deny resignation requests, while still enabling them to collect dues from employees who are no longer members — at least for a period of time. If passed, the law may put the state of Connecticut in a legal bind, forcing the state to enforce authorization windows for union dues if a legal challenge arose. It could also mean legal disputes regarding dues and union membership would no longer be a matter of a contract between an individual and the union but rather the individual and the state. The proposed bill would also restrict who employees who wish to resign from informing their employer – either a state or municipality – of their decision. According to the bill, employee requests to revoke or change dues authorizations would have to be directed to the union rather than the employer. According to the Janus decision an employee must give affirmative consent to have union dues deducted from their pay, but the proposed bill essentially leaves the matter of dues deduction solely in the hands of the unions, who would not have to provide initial documentation to the state or municipality. The increase in union membership was largely the result of union administrative mistakes; a number of employees were classified as agency fee payers even though they had never actually opted out of the union. Despite the increase in membership, money flowing into union coffers decreased overall, according to figures provided by the State Comptroller’s Office. The membership card bill was one of four union bills proposed by Porter and D’Agostino, which would enhance unions’ ability to retain and recruit members. Proposed Bill 6935 would require the state or municipality to confer with the union before issuing any communication to its employees regarding their rights to either join or resign from a union. Proposed Bill 6926 would require the state or municipality to provide worker information, including their home addresses every 120 days. And Proposed Bill 6930 would require the state or municipality to allow unions access to new employee orientations so the union can make its membership pitch. The bills – which are only in concept form at this point – will likely have a receptive audience in the Labor Committee. Six lawmakers on the committee are either current or former union officials, and Porter serves as co-chairwoman along with Julie Kushner, D-Danbury, a former union organizer and co-chair of the Working Families Party. Neither Rep. Porter or D’Agostino replied for comment. I would like to testify against this illegal membership card Joe Aresimwicz is shoving down our throats. AFSCME has never represented it’s members equally. This is why they love Arbitration to hide crimes against women and men. I would like to testify if it’s not too late. My evidence is irrefutable and not hearsay by far.